The Anaheim Ducks announced a pair of moves last night, just prior to their game, calling up forwards Sam Steel and Kiefer Sherwood from the nearby San Diego Gulls of the AHL. The Ducks are headed toward a bottom-five finish in the league this season and are testing out their young players as they already look toward next year. Steel, 20, has five points in 17 games with Anaheim this season, while Sherwood, 23, has been a more regular contributor with ten points in 47 games. One would expect both young forwards to be given every chance to earn a starting role in 2019-20, beginning with an increased workload down the stretch. Arizona Coyotes prospect Dennis Busby has joined the organization on a tryout basis for the rest of the season. The AHL’s Tuscon Roadrunners announced that the Flint Firebirds standout, who missed much of the past two seasons due to injury, has been added to the roster on an ATO. It is commonplace for junior prospects to get some pro experience in the AHL late in the season on tryouts, but there is a little more at stake for Busby. The 2018 fifth-round pick has yet to be tendered an entry-level contract and the Coyotes may have some concern after he played in just 29 OHL games combined in the last two years. The puck-moving, right-shot defender could be a valuable asset and a strong showing in Tuscon would go a long way in proving to the Coyotes that he is worth holding on to. The Roadrunners also signed a familiar name to a PTO yesterday, adding former second-round pick and fan favorite Akim Aliu to the roster on loan from the ECHL. Aliu, now 29, is hockey’s foremost Nigerian-Ukrainian-Canadian player and, at 6’4″, 225 lbs., plays an entertaining physical brand of hockey, whether he’s lined up at defense or forward. The Detroit Red Wings announced they have swapped emergency defensemen as the team has recalled Dylan McIlrath from the Grand Rapids Griffins and assigned Libor Sulak to the AHL. Sulak had been recalled Wednesday, but has been sidelined by an illness for the last two games, so the team opted to bring in McIlrath to replace him. The 26-year-old McIlrath was the 10th pick overall in the 2010 draft, but has appeared in just 43 NHL games since then and hasn’t played there since playing five games with the Florida Panthers in 2016-17. Since being acquired from Florida that same year, McIlrath has played exclusively for the Griffins since then. The Colorado Avalanche have recalled forward A.J. Greer from the Colorado Eagles of the AHL, according to CapFriendly. Greer, who has been going up and down several times already this season, was sent down on Thursday to the AHL. The 22-year-old has fared well in the AHL with 18 goals and 42 points in 48 games with the Eagles. He has a goal and an assist in 15 games with the Avalanche so far this year. The Buffalo Sabres announced they have recalled defenseman Lawrence Pilut from the Rochester Americans of the AHL. The blueliner has appeared in 25 games for the Sabres this year, but was sent to Rochester in late February to work on his skills. With injuries to Zach Bogosian and Matt Hunwick injured, the team needs Pilut to help out. The 23-year-old was almost a point-per-game defenseman with the Amerks with 26 points in 28 games. He has a goal and six points with the Sabres in his rookie campaign. The Los Angeles Kings announced they have recalled Michael Amadio from the Ontario Reign of the AHL and will go with the team on their upcoming three-game road trip. Fox Sports’ Jon Rosen adds the team will not take forward Brendan Leipsic on the road trip in favor of Amadio. The 22-year-old has played 37 games for L.A. this season with four goals and eight points, while posting six goals and 22 points in 24 games with the Reign. The Anaheim Ducks have dealt with more than their fair share of injuries over the past year or so. The team is still far from healthy, but finally full strength is within sight, particularly among their battered forward corps. The likes of Ryan Getzlaf, Ryan Kesler, and Patrick Eaves are healthy, and recent injuries like those to Jakob Silfverberg and Kalle Kossila have also run their course. Nick Ritchie and Ondrej Kase are on the mend and expected to be active sooner rather than later. Corey Perry (knee) and Carter Rowney (upper body) are still far from a return, but in terms of players the Ducks reasonably expected to be healthy, things are looking up. However, a full set of healthy forwards also brings with it some tough choices. 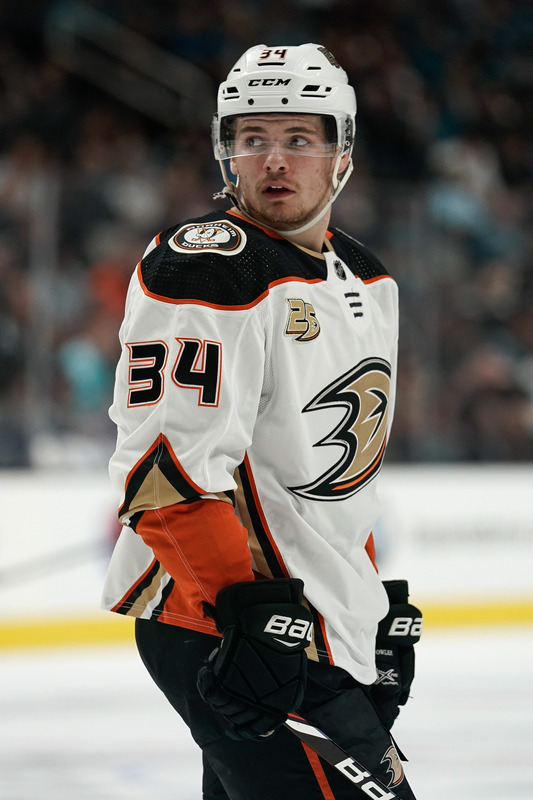 While Anaheim has the flexibility to send the likes of Ben Street, Pontus Aberg, Sam Carrick, and Kiefer Sherwood – currently on the roster – to the AHL, they have to be concerned about whether there is enough ice time to go around for the more permanent pieces. Already, the team sent promising rookie Isac Lundestrom to the AHL today to bring up Kossila and fellow top prospects Sam Steel and Troy Terry are already down with the San Diego Gulls. As the team grows healthier, it it possible that they could explore returning rookie Max Comtois to his junior club, the QMJHL’s Drummondville Voltiguers. While Comtois has already played in ten games this season and tolled the first year of his contract, he cannot be sent to the AHL and could be better served getting guaranteed top-six minutes at the junior level than fighting for ice time with the Ducks. Comtois is currently sidelined, buying Anaheim some time on the decision, but with conceivably an upwards of 20 forwards expecting to see action in the NHL this season, eliminating even just one option by sending Comtois back to junior would help the Ducks with their impending roster crunch. The Los Angeles Kings took another hit in net today with the news that backup goaltender Jack Campbell will be out four to six weeks with a torn meniscus. The team is already without starter Jonathan Quick due to the same injury and are left to lean on veteran Peter Budaj and rookie Cal Petersen for the time being. Fortunately, GM Rob Blake did assure the media later on that Quick remains on track to return sometime around the end of the month, per beat writer Curtis Zupke. Quick underwent surgery on October 31st and was given a timeline of roughly a month to return. So long as his rehab continues to progress positively, Quick could potentially be ready to return by the Kings’ November 30th clash with the division rival Calgary Flames. Yet, even in that best-case scenario, Budaj and Petersen will still be on the hook for the nine games between now and then. In more immediate injury news, The Athletic’s Craig Morgan reports that Arizona Coyotes defenseman Jakob Chychrun is “probable” to make his season debut on Tuesday night against the Detroit Red Wings. Chychrun has been sidelined since late last season with a torn ACL in his right knee. The first-round pick was establishing himself as a reliable top-four defender prior to his injury and his return should come with an automatic starting spot, likely bumping Ilya Lyubushkin down to the minors and Jordan Oesterle from his starting slot. The Anaheim Ducks have lost six straight games after falling to the Philadelphia Flyers 3-2 last night, and look like they’ll be making some changes. The team has recalled Kiefer Sherwood and Kalle Kossila from AHL San Diego while sending top prospect Sam Steel back down. Steel saw his ice time drop to just over 11 minutes against the Flyers, easily the lowest total of his young career. In addition, Joseph Blandisi has been returned to the AHL. Selected in the first round of the 2016 NHL Entry Draft, Steel is still just 20 years old and is in his first year of professional hockey. A dominant offensive player at the junior level, he was limited to just three points in his first 13 games with the Ducks and none since scoring his first NHL goal on October 21st. Like many of the Ducks, his possession statistics have been quite poor through the first month of the season though he was holding his own in the faceoff circle at exactly 50%. That isn’t enough to keep him in the lineup though, and the Ducks will hope he can get his offensive confidence back while playing in the minor leagues. The team has a game tomorrow against the New York Rangers, and it looks like Patrick Eaves may be ready to make his season debut after skating this morning on a line with Adam Henrique and Isac Lundestrom according to Eric Stephens of The Athletic. The team has also reunited the line of Andrew Cogliano, Ryan Kesler and Jakob Silfverberg as they try to spark their group. After riding a hot John Gibson to a few wins at the start of the season, the Ducks find themselves in a tailspin towards the bottom of the Pacific Division and could quickly find themselves at a real disadvantage in the playoff race if they can’t turn it around. 6:52 PM: The Ducks have officially announced the signing of Sherwood to a two-year, entry-level deal. 3:03 PM: Aaron Portzline of The Athletic (subscription required) and Eric Stephens of the Orange County Register are both reporting that Kiefer Sherwood of Miami University (Ohio) has signed with the Anaheim Ducks, and that the contract will be officially announced later today. Portzline writes that Sherwood will be assigned and could make his debut for the San Diego Gulls as early as this weekend, suggesting that the two-year entry-level contract will kick in for this season. Though Portzline writes that the contract is a three-year deal, the 22-year old Sherwood can only sign a two-year entry-level contract because of age restrictions. If it does in fact start in 2017-18, that means he would become a restricted free agent after next season. The playmaking forward could strengthen the Ducks’ prospect group even further, which already should get a big boost the next few seasons with Sam Steel, Max Jones and others graduating from junior hockey. Sherwood is the older brother of Kole Sherwood, who signed his entry-level deal with the Columbus Blue Jackets way back in 2015 after going undrafted. He’s playing for the Kitchener Rangers this season, but will likely jump into the professional ranks not long after his brother.